Following a €1.1 million price drop in March 2012, Adrian Nicolle at Nicolle Associates sends word of a further €1.55 million price cut on the 32m sailing yacht Liara. 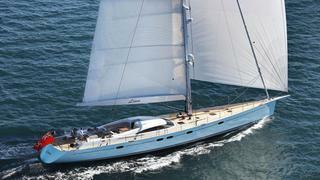 The flagship of the Performance Yachts range, Liara was built in 2009 to RINA class. Designed for the optimum combination of performance and comfort, Liara has a carbon hull and mast, a lightweight interior and a hydraulic lifting bulb keel. MCA compliant, she offers accommodation and amenities for up to eight guests in an understated interior finished in light, natural wood tones. Fully refitted in winter 2011/2012 she had more upgrades just last month, with new saloon and deck upholstery and a full sail wardrobe overhaul. Liara is now down from €7.5 million to €5.95 million.